I am here to tell you about a rich experience that I had last week. How I learnt that traditional cuisine must be preserved in it's pure form while we go on to experiment with fusion as well. I got an opportunity to talk to Chef Arvind Saraswat and how he insisted that too much experimentation in food can be destructive. More about this discussion later, first let me introduce to this place. 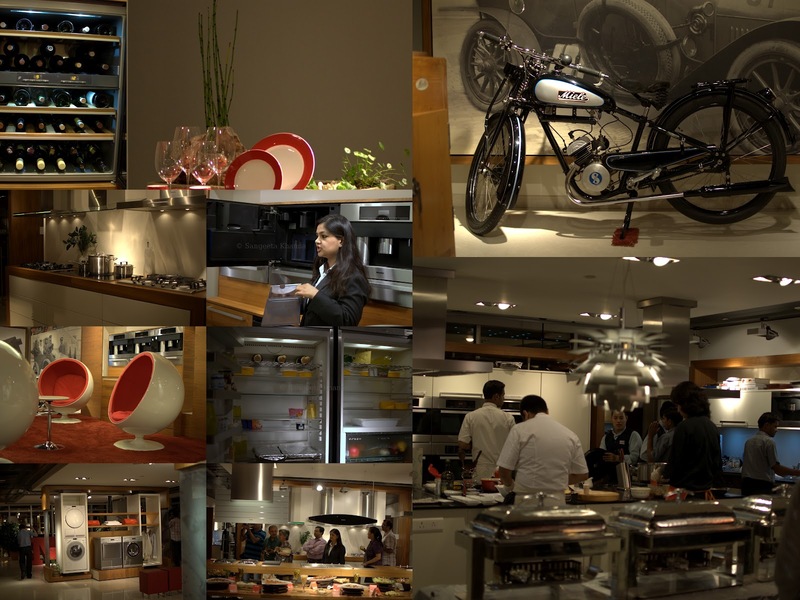 Chefs at Miele experience Center is an exclusive space at Jasola District Center to showcase the state of art kitchen and home gadgets. It is a luxuriously done up place that was buzzing with activity when we entered. Aromas of the finest food being cooked was expected but it was not there as the kitchen area is designed in a way that it doesn't let the cooking aromas linger around. That is a great thing for a home kitchen. 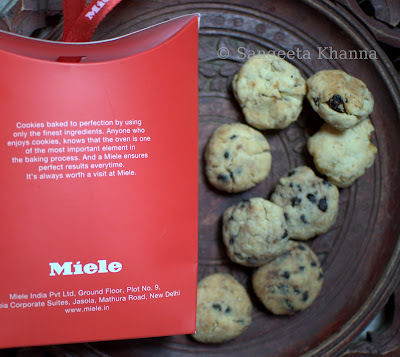 Miele had organised an event with Chef Sabyasachi of Olive Bar and Kitchen in association with Four Seasons Wines and the Bloggers of Delhi were invited to be a part of this experience. It was a live cookout with Chef Sabyasachi (Best Chef of India, Awarded by President of india, National Tourism Award, 2011-12) and his team Chef Astha, Chef Mahima , Chef Kapoor and Chef Gaurav at this buzzing place. The Antipasti table was already laid out under soft lighting. Beautiful platters arranged creatively. There was a lot to eat here but not much choice for vegetarians. The cheeses and Potato salad was there for them but I found Apeksha Jain looking for options. There were the best Spinach and feta tarts and fresh tomato and mozzarella Caprese on skewers for vegetarians on the circulating menu though. I am not complaining at all. Us non vegetarians were spoilt for choice. Chorizos, Salami, Crispy fried bacon all dressed up with the best quality Extra Virgin Olive oil and pecans. 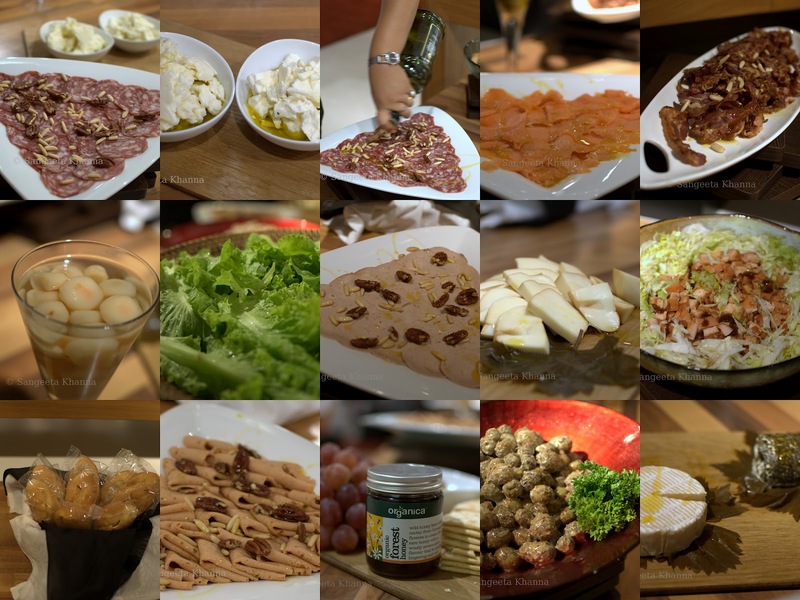 The different kinds of cheeses, a potato mustard honey salad and an Apple and Sausages salad were all yummy. The smoked chicken and Lettuce salad was something I would like to recreate in my own kitchen. The place looks perfect with a display of all Miele gadgets. The huge and spacious fridge made me drool big time, designed to perfection, not very deep so everything can be located easily.. And a dream coffee machine that Divya showed us around was something to keep thinking about. The chefs were busy cooking all the main course and pass around snacks. I loved the Spinach and Feta tarts and the Prawn Gambas. A nicely skewered Caprese with Cherie tomatoes was a refreshing treat. Bread baskets displayed beautifully on each table with a Four Seasons wine bottle. 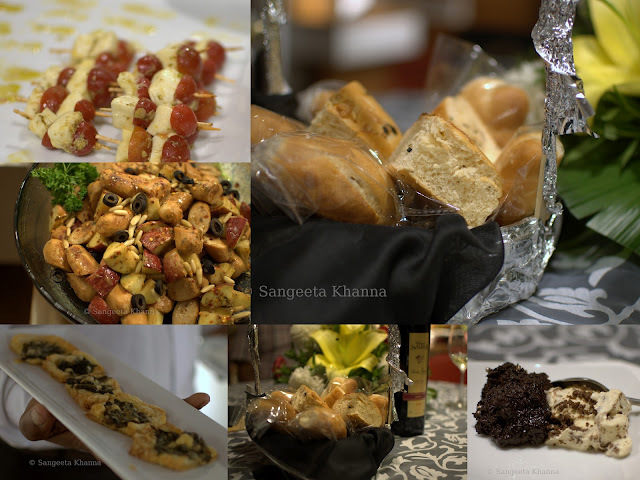 The breads on display were Focaccia, mini Baguettes, Lavash and some bread sticks. 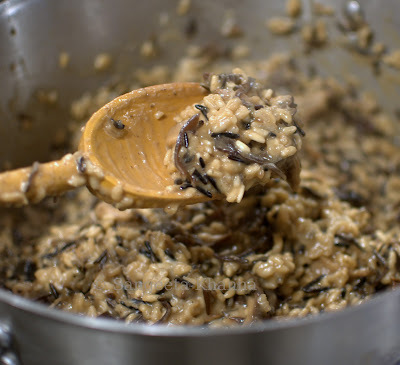 The favorite Risotto (mixed mushrooms and black and white rice) of Chef Saby was made for us food bloggers as we had liked it at Olive last time as well. This Risotto is also going to be recreated in my own kitchen. I have some dried black mushrooms and would get some more fresh varieties to make this one. A complex mixed flavor of mushrooms in Risotto is really interesting. There were a lot of main course dishes to choose from. Pork belly in honey soy glaze, Chicken confit, a lovely couscous with cherie tomatoes and chickpeas and some great vegetarian dished and the vegetarians were glad here. See a detailed album here at Miele page. 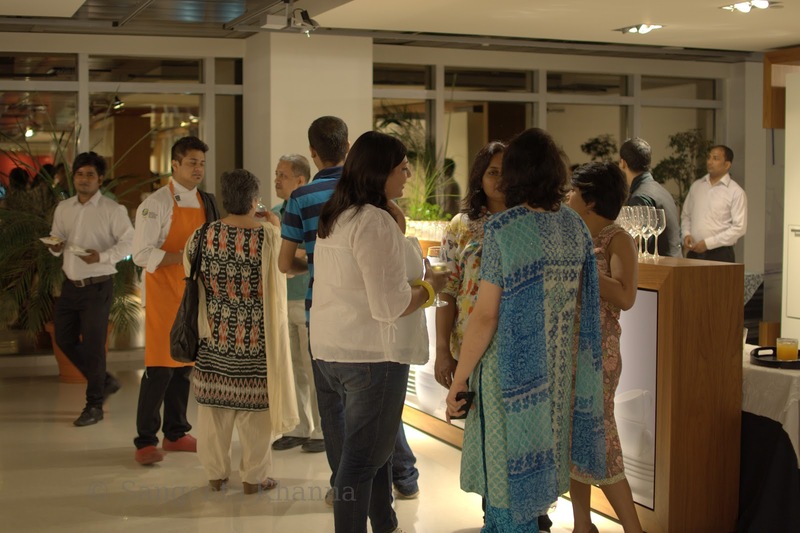 As the time passed we were surprised to see the star Chefs of Delhi arriving at the Miele center. 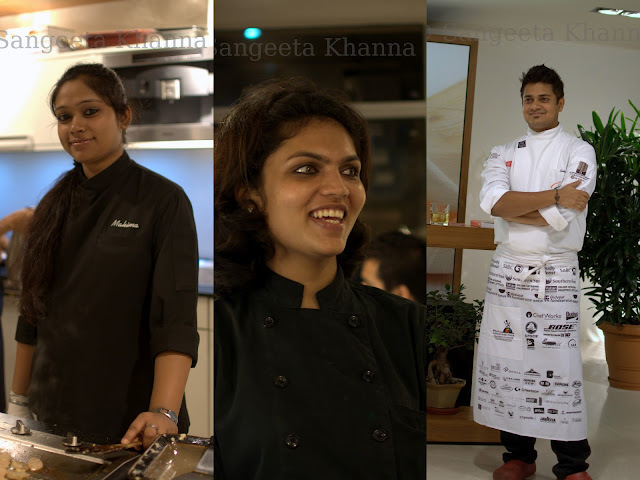 Chef Arvind Saraswat, Chef Devendra Kumar, Chef Maninder Gill and Chef Sibal were there with us. I couldn't believe we could go and have a chat with the best Chefs of India there. I had a relaxed chat with Chef Arvind Saraswat and he came across as a very nice gentleman, very soft spoken and down to earth. I asked him what he thought of food bloggers and was a little surprised by his reply. He said he has no opinion on them as it is a new phenomenon and he is not much aware of any good thing going on with food blogs. I asked isn't it great that foodies and cooks all over he world are communicating so well with each other and exchanging ideas about their food and culture. To this he said it's not always a good thing. He said it so unpretentiously but so convincingly I started thinking. A light bulb moment for me, till now I was all about this communication and exchange between different food cultures. His interpretation made sense. Too much interaction and experimentation with fusion is disturbing. It can be very disastrous as it threatens to meddle with the authenticity. I understand as a research oriented mind that preserving the gene pool in it's purity is as important as diversifying the gene pool. There can be germplasm banks to preserve cereal and lentil (and all plants in fact) ethnic varieties but how a recipe would be preserved if it gets diluted or polluted by other cultures. New evolved taste is fine but there should always be a baseline of the authentic cuisine that is not bastardised by mixing up. Fusion will be healthier and better if the baseline is clear. An engaging discussion that enlightened me too. I have always been a great believer in experimentation but now I understand how important it is to preserve a cuisine in it's purity. I try to practice this principle on Banaras ka Khana but that was just because I love all desi food, now it will be with more awareness thanks to Chef Arvind Saraswat. And Thanks to Chef Sabyasachi for giving me this opportunity as well. We got the opportunity to hear Chef Maninder Gill who shared that his best meal till date was one prepared in an ashram at Rishkesh, a vegetarian meal prepared using Beet greens and such things. How simple it is to enjoy basic food with such love we realise when we these greats talking about it with passion. 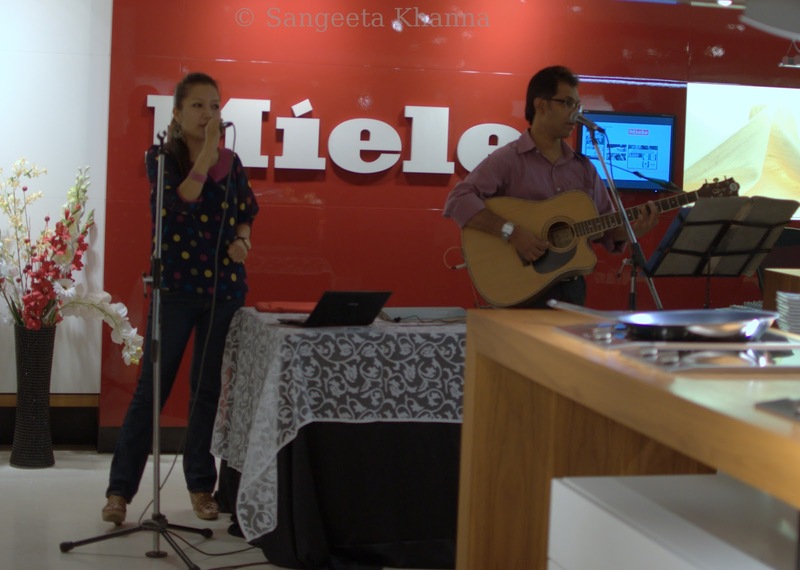 Mr. Chaturvedi from Miele introduced us to the brand and how the gadgets are energy efficient and environment friendly, apart from the best contemporary designs. 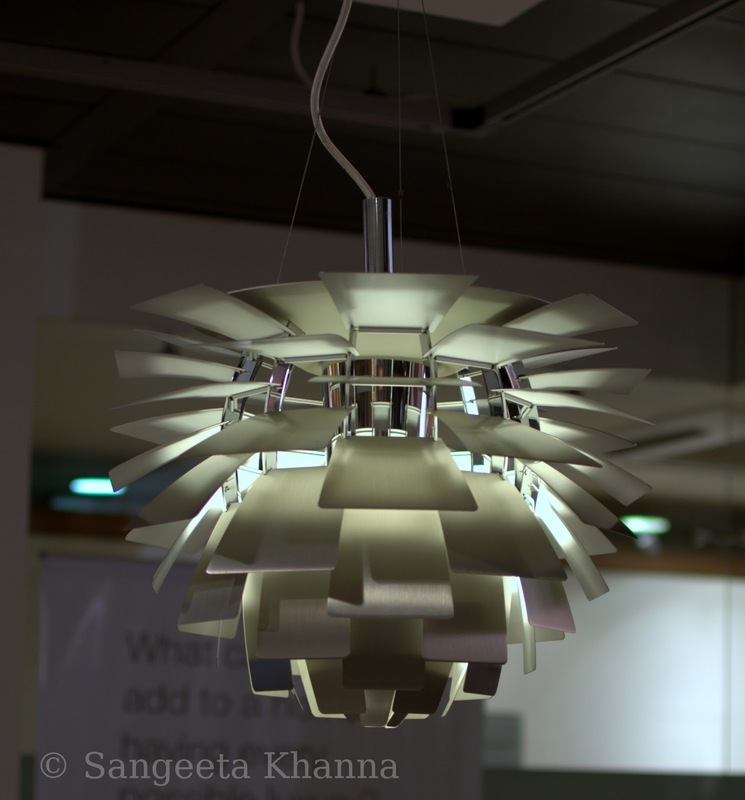 Such a modern design that seems to respect softness in light and an ancient design element that a flower is. Mr Abhay Kevadkar of Four Seasons Wines spoke about his wines and how they should be paired with Indian foods. There was a live band at Miele center and we were humming the songs without realising it. Not too loud and intrusive but yet growing onto you kinda music. It was an evening well spent listening to some inspiring people, having incessant chatter with blogger friends and lusting over some of the most luxurious gadgets. There was a sweet token of love, we were gifted a pack of cookies which were baked by Saby's team at the Miele center itself. The good thing is, these cookies were not sweetened and I loved them. Slightly salted dough and some sweet choco chips in one variety and some nuts and raisins in the other one. What a nice balance of sweet and salt. We all had a good time as I mentioned. Sushmita, Nachiketa and Apeksha were there from our Delhi food bloggers group. I loved clicking pictures and there were so many that I had to finally decide to make collages to accommodate all pictures. It happens when there are too many good things happening at a place..
yess! it was a lovely evening...and i did not mind the limited vegetarian choice..i had eyes only for the awesome risotto!! !